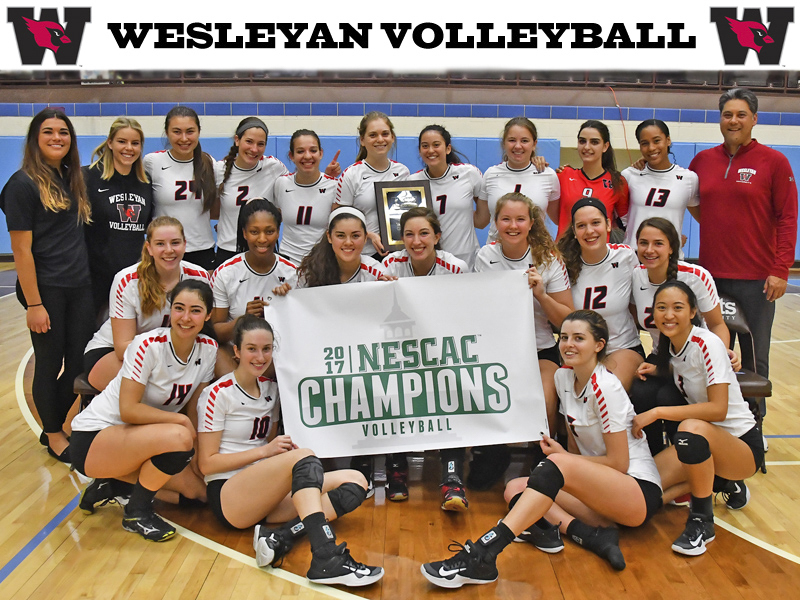 For the first time ever, Wesleyan can welcome home a NESCAC championship-winning volleyball team. The Cardinals downed Williams, Bowdoin, and Tufts in order to claim the title that has eluded them since the NESCAC was formed in 1971. Given how the team has been playing this season, it seemed inevitable that they would capture the title. The excitement of the championship weekend started Friday night when the Red Birds faced Williams for the second time this season. Wes took a quick 3-0 lead in the first set and never let the Ephs back into the game. Though they tied the game at 4-4 early on, a service error from Williams spurred a five-point run for the Cardinals, and Williams never recovered, giving Wes the first set 25-11. The next set was very similar, with the Cards coming out energetically, taking an early lead, and claiming a decisive 25-14 victory. The Ephs played the third set much more competitively, scoring the first point, and leading for ten of the first fifteen points. With the game tied at thirteen, Gabby Bennett ’20 did what she does best. Off of an assist from Kaira Muraoka-Robertson ’20, Bennett made a kill that spurred another five-point run. Wesleyan claimed the lead and eventually took the last set 25-17, giving them a spot in the semifinals. On Saturday afternoon, the Cardinals faced third-seeded Bowdoin in the semifinal contest. The match started in Wesleyan’s favor with two aces from Phia Bellizzi ’21, but Bowdoin was not rattled. The Polar Bears worked their way to a 21-16 lead, and Wes couldn’t quite close the deficit; Bowdoin won the first set 25-21. Though Bowdoin again scored first to start the second set, the Cardinals’ offense continued to improve from the previous set. Following a Bowdoin service error, Wes went on an 11-1 run to make the score 18-6. The teams traded points back and forth the remainder of the match, but Wes had given themselves a comfortable lead and won the second set 25-18. Bowdoin again went ahead early in the third set, leading Wes 18-11 until a kill by Sarah Swenson ’18, assisted by Muraoka-Robertson, started a nine-point run that gave Wes a 20-18 lead. This gave the Cardinals the momentum they needed to win the third set 25-21, and then the fourth set 25-16. With that, the Dirty Birds punched their ticket to the NESCAC championship for the first time since 2001. Facing off against the top-seeded Tufts Jumbos, who shut out the Cardinals in the regular season 3-0, the team knew they were in for a challenge. They played a close first set but made thirteen costly errors and dropped the game to Tufts 25-22. The second set was even closer and more exciting, with neither team giving the other an inch, forcing each other to play nearly perfectly. The Cardinals rose to the challenge, and a kill from Swenson gave the team the push they needed to claim the set 25-23. Wesleyan led for the entirety of the third set, playing with poise and confidence to force 11 Tufts errors, while only committing four of their own. Throughout the set, they only let the Jumbos within two points of the lead and finished it 25-17. The fourth started out close, with eight points played at a tied score. Then, a Tufts attacking error and a kill by Nicole Hilton ’20 sent Wesleyan on another run, and they never let Tufts back into the game. Finally, on another beautiful kill by Bennett, from Muraoka-Robertson, Wesleyan volleyball claimed their first NESCAC championship title, beating Tufts in the fourth set 25-14 to take the match 3-1. Just two years ago, the Dirty Birds’ volleyball team ended their season with only five wins and missed the playoffs for the fifth year in a row. Last year, the Cardinals hinted at an upswing, finishing the season 15-8 with a loss to Amherst in the NESCAC quarterfinals. But this season, the Red and Black left no doubt that they are a team capable of competing at a very high level. And, as the team heads into the NCAA Division III tournament this weekend, they’ll have to do just that. To begin, Wesleyan is matched up against Wellesley College in the first round for what is sure to be a thrilling Friday night. Although the schools’ names are easily confused, once both teams hit the court at 5:3o p.m., there should be no doubt which team is superior (hint: it’s going to be the Cards). The game will take place in Providence, R.I., but it will also be streamed online with a link on Wesleyan’s athletic website. All we can do now is wait with nervous anticipation for Friday night and hope for a Cardinal victory.